It’s Thanksgiving, and it’s your turn to bring the pumpkin pie. Regardless of whether you made the pie or picked one up at the store on the way, that dessert is going to be very satisfying after a big Thanksgiving dinner. Equally satisfying will be when you show up in your new 2017 Toyota Corolla iM. Pie may be filled with calories, but the generous helping of features in the Corolla iM is not. The 5-door Corolla iM offers a roomy interior that comfortably seats five. The hatchback flips up, so you have easy access to your cargo. If needed, you can flip down the 60/40 split rear seats and extend your cargo area. That’s perfect for bringing along the family dog on your holiday trip. The driver and front passenger are snugly seated in heated sport seats that offer comfort and warmth on a cold winter day. The driver’s seat is 4-way adjustable to help you find the perfect position for long trips. Your front seat passenger can make two adjustments to their seat. Dual air conditioning allows everyone to control their own climate. You’ll love the way your hands feel when you wrap your fingers around the leather wrapped steering wheel. Take control of the vehicle in a state-of-the-art cockpit that offers bold design, easy-to-read instruments and a command center at your fingertips. A leather wrapped shift knob feels right as you shift gears. 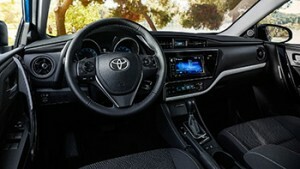 In addition to having a 7-inch touchscreen display screen to keep you connected, Toyota added audio and hands-free device controls directly onto the steering wheel to make it easy for you to remain focused on the road in front of you. When you connect your smartphone to the 2017 Corolla iM entertainment centre, you immediately have access to your favourite apps, radio stations, web content and Bluetooth® connectivity. You can use the voice recognition feature of Gracenote to access your favourite artists and songs and have them played on demand through the six speaker audio system. All those amenities are nice, but how does it perform? Toyota put a 1.8 litre, 4-cylinder 16 valve DOHC VALVEMATIC engine capable of 137 horses under the hood of the Corolla iM. It comes standard with a 6-speed manual transmission that gets 8.8/6.8 (city/highway) L/100km. If you prefer an automatic transmission, then swap the manual for a Continuously Variable Transmission Intelligent Shift (CVTi-S) that offers practically stepless gear changes for a smooth transition between gears and flawless acceleration. The CVTi-S does not waste any power, and that means better fuel efficiency. It gets 8.3/6.5 (city/highway) L/100km. The MacPherson strut front suspension and the rear double wishbone make it a comfortable and sporty ride. The 2017 Toyota Corolla iM comes standard with Toyota Safety Sense™-C and the STAR Safety System. These two safety packages are filled with safety features for any condition. The Toyota Safety Sense™-C consists of the Pre-Collision System, Lane Departure Alert and Automatic High Beams. The Pre-Collision System uses the built-in front camera and laser radar to detect objects in your path. The system will alert you to an impending collision visually and audibly, and if you do not respond, it will act on your behalf by applying the brakes. The STAR System consists of Vehicle Stability Control that prevents the loss of traction and Traction Control that helps you when the road is icy. It has ABS for brake lockup prevention, Brake Assist for full brake pressure during a panic stop, Electronic Brake-force Distribution to prevent destabilisation during braking and Smart Stop Technology that cuts engine power during a hill start. If you want to experience an exciting ride, then the 2017 Toyota Corolla iM is serving up a satisfying driving experience. There are many other features to see and explore, so stop by today for a test drive.